What are some of the main features of the Party Mix Pro? What DJ program is included with the Party Mix Pro? Where can I download the included copy of Virtual DJ LE? Can I scratch with these platters?Are the performance pads velocity sensitive? What type of lights effect does the Party Mix Pro offer? Can you pair with a Bluetooth device with the Party Mix Pro? What is the Bluetooth range of the Party Mix Pro? How long does it take to charge the battery and how long will a fully charged battery life last? How can I replace the battery in the Party Mix Pro? What kind of microphone can be used with the Party Mix Pro? Can you pair to another speaker to expand the audio? What is the weight and dimensions of this product? Virtual DJ LE - a popular DJ program that can be utilized on a Windows or Apple computer. DJ Player Pro - an IOS app that can be utilized only on iPhone, iPad or iPod touch using a USB Camera adapter, purchase separately (click here). Yes! In fact, some people prefer scratching with smaller jog wheels. Since the jog wheels are smaller, they have less mass and can move much more quickly and feel more responsive than larger platters to some people. The performance pads on the Party Mix Pro are not velocity sensitive. Connect headphones to the headphone output on the Party Mix Pro controller. 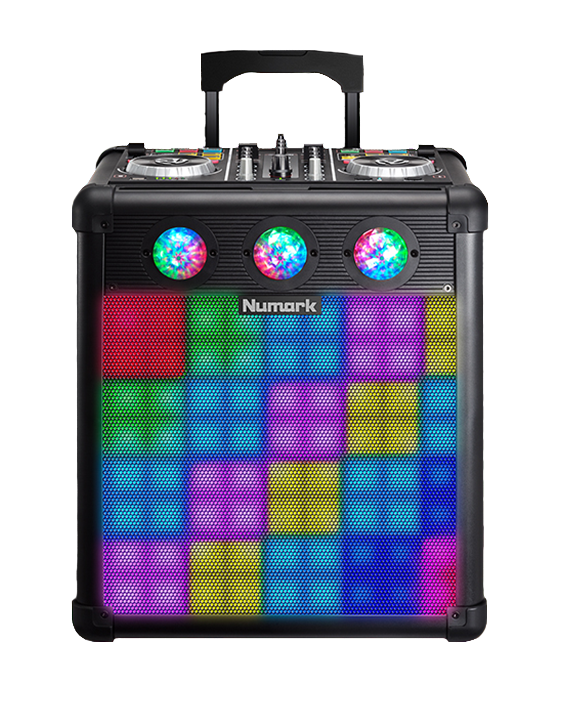 Make sure that your Party mix Pro hardware is selected and being used by Virtual DJ. When launching Virtual DJ LE, be sure to select Use Soundcard to auto-setup the Party Mix Hardware, or select Party Mix Pro in the software under Config > Controllers. See this video for a walkthrough using the included Virtual DJ LE software. Yes, you can pair with any mobile device like Android or Apple brands. Power on the Party Mix Pro. Press the Bluetooth button to disconnect from other devices and begin the pairing process. Find and select "Party Mix Pro" in your Bluetooth device menu. Play music from your Bluetooth device. Adjust the volume from Party Mix Pro by moving the Master Volume knob clockwise or counterclockwise to decrease or increase the volume. To disconnect pairing, turn off Bluetooth on your device or select “Delete paired info” from the Party Mix Pro Bluetooth menu. Note: Bluetooth range is affected by walls, obstructions, and movement. For optimal performance, place the Bluetooth range is affected by walls, obstructions, and movement. For optimal performance, place the product in the center of the room so it is unobstructed by walls, furniture, etc. It takes approximately 10 hours to charge the Party Mix Pro battery from empty to full. A fully charged battery can last up to 8-12 hours of battery life with all lights and 75% volume. Yes, the battery is user replaceable. Instructions on the process coming soon. Any dynamic microphone with a 1/4 male cable.